Longs Peak is one of the most coveted peaks in Colorado. It has an elevation of 14,259 feet. It is located in Boulder county, north-central Colorado, United States. It towers above all other summits in Rocky Mountain National Park. This peak was named after an American army officer who was also an explorer, Major Stephen H. Long. He encountered the mountain in 1820. Longs Peak is one of the most popular 14,000 feet peaks to climb. This odd-shaped peak serves as the centerpiece of Rocky Mountain National Park. It has both sharp corners and flat faces. The climbing season for Longs Peak starts in early July and then ends in the middle of September. The regular and most travelled route to the summit is the Keyhole Route. The round trip is 16 miles. This route is a climb not a hike. It crosses sheer vertical rock faces, often with falling rocks. You need to be experienced to take it on. The successful summit rate for Longs Peak is approximately 47% according to recent studies (climbers who actually reach the peak). If you want to complete your round trip in one day then the general rule is that you should start the Keyhole portion before 6 AM. Even before beginning the climb to the summit, the climbers will have more than 5 miles of hiking. There are a few camp spots in the boulder field but climbers have to obtain a back country permit and reserve a camping spot. Longs Peak and Mount Meeker both are known as Two Guides by the Arapaho Indians. Declan, Tobin. " 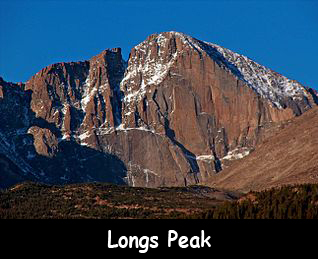 Facts for Kids about Longs Peak ." Easy Science for Kids, Apr 2019. Web. 25 Apr 2019. < https://easyscienceforkids.com/longs-peak/ >.